This blog covers all things baseball in 1977. Baseball cards from that year is a main focus of the site. Jim Kern was a relief pitcher who had most of his success in the late 1970s. His nickname was "The Amazing Emu". Jim was signed by the Cleveland Indians in 1967. He pitched at Rookie Ball and A level in 1968 and then missed the 1969 season due to military service (he was in the Marine reserve). Kern was a starting pitcher in the minors. He made slow but steady progress through the Cleveland system until finally getting a September call up in 1974. Jim appeared in four games (three of them starts) for the Indians in 1974 and was 0-1 with a 4.70 ERA. In 1975 Kern split the season between AAA Oklahoma City and the Indians. 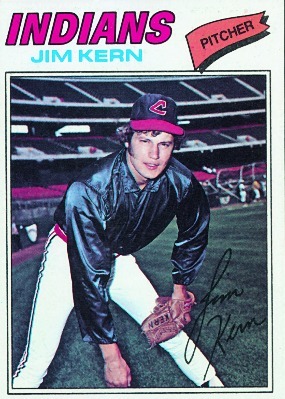 Jim was 1-2 with a 3.75 ERA for Cleveland in '75. In 1976 the Indians converted Kern to a reliever. He made 50 appearances (two of them starts) during the season. Kern would start only three more times during the remainder of his career. It was Kern's breakout season -- he had a 10-7 record with a 2.37 ERA and had 15 saves. Jim made his first All Star Game roster in 1977. He pitched a scoreless second inning and struck out Dave Parker and George Foster. Kern was an AL All Star again in 1978 and pitched 2/3 of an inning in the game. Jim appeared in 58 games and had a 10-10 record with 13 saves. After the 1978 season Kern was traded (with Larvell Blanks) to the Texas Rangers for Bobby Bonds and Len Barker. 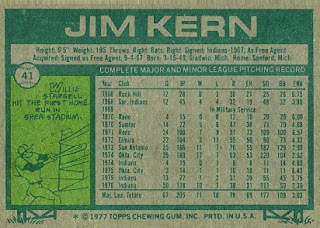 The 1979 season was Kern's best year. He finished fourth in AL Cy Young Award balloting and 11th in AL MVP voting. Jim went 13-5 with a 1.57 ERA and had 29 saves. He also made his third (and last) AL All Star team. This time Jim didn't fare as well -- he took the loss when he walked Lee Mazzilli with the bases loaded in the top of the 9th to put the NL ahead to stay. Jim's fortunes completely reversed in 1980. He slumped to a 3-11 record, had a 4.83 ERA, and saved only two games. Kern played hurt with several injuries for much of the year. In 1981 Kern bounced back -- he made only 23 appearances but was 1-2 with six saves and had a 2.70 ERA. He missed almost six weeks (from late April to early June) with an injury and then the players went on strike shortly after he came back. After the 1981 season Jim was traded to the New York Mets for Doug Flynn and Dan Boitano. He never pitched for the Mets -- in February 1982 Jim was traded (with Greg Harris and Alex Trevino) to the Cincinnati Reds for George Foster. Jim wasn't happy in Cincinnati. Tom Hume was the main guy out of the bullpen and the Reds were rebuilding. He pitched well (3-5, 2.84 ERA, 2 saves in 50 games), but he asked to be traded in early July. The Reds accommodated the request in August, shipping Jim to the Chicago White Sox for two minor leaguers. Jim didn't do as well for the White Sox -- he went 2-1 with a 5.14 ERA in 13 games. Jim pitched in only one game for the White Sox in 1983 due to an injured elbow. Kern was cut during spring training in 1984 and he wasn't happy about it. Jim was picked up by the Philadelphia Phillies in early June, but he was with the club for less than two months. Kern was 0-1 with a 10.13 ERA in eight appearances for the Phillies. Jim was signed by the Milwaukee Brewers in August, pitched in AA for a couple of weeks, then was brought up to Milwaukee and went 1-0 and didn't allow a run in six innings. In 1985 Jim started the season in AAA Vancouver after being beat out by Jim Ladd in spring training. Kern was brought up in May, but he was released in June to make room for Pete Vuckovich, who was coming off of the disabled list. Jim had a 6.55 ERA in five appearances and had an 0-1 record. The Indians signed Kern in 1986. Jim didn't fare well with the Indians (1-1, 7.90 ERA in 16 games) and was released on June 17. Jim now works as an on-site general manager at the Rainbow Bay Resort in Anchorage, Alaska. Here is a "where are they now" article from 2011. Aug 20: Pitched out of a bases loaded jam in the 11th inning, then gained the victory in the 12th inning after Andre Thornton homered. Kern pitched 3 2/3 innings in the game. Which set should be the focus of my next set blog?